Using MicaFilm covering for tail surface hinges. The Polecat XP-4 and Taboo tail surfaces come with a MicaFilm hinge. 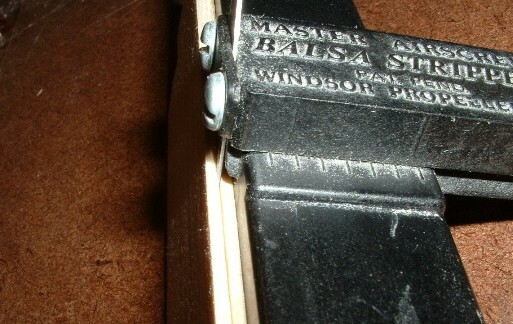 The hinge material is a strip of covering called Micafilm. It has mica fibers in it for reinforcement. Unlike most other covering material it does not have a glue backing. After you insert it in the edge slots, CyA will leach into the hinge material and glue it into the slots, yet the hinge will still remain flexible. Micafilm is a fiber reinforced covering which makes it a thin, light, strong, permanent hinge that seals the full length of the joint. I've used this hinge material on my Avenger II and my Bug x-tail. Works great. The entire length of the hinge is sealed yet you never have to worry about hinge tape needing to be replaced. It's much easier to make the hinge line slit before you do any sanding or bagging. 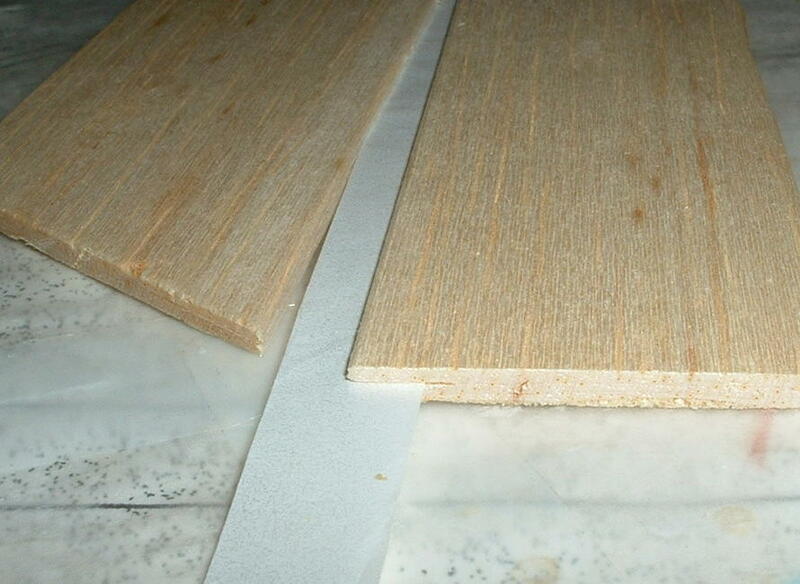 For the first ones that you try (including test tries on scrap balsa) it's best to start with just two flat pieces of balsa. There's no guarantee that you won't mess up the hinge slit. 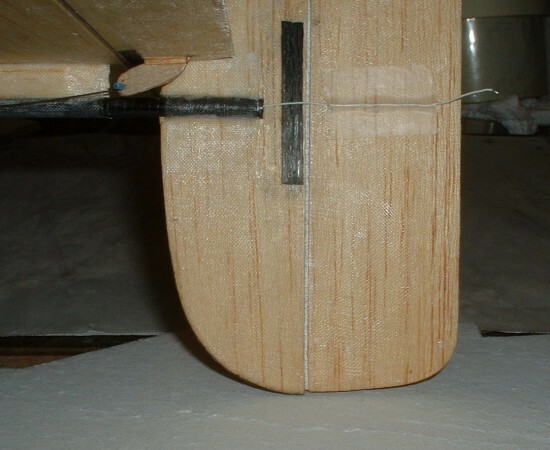 Start with a piece of balsa that is 1/4" wider than needed. That way, if you mess up the first attempt for the slit, you can cut 1/4" off the hinge line and try again. The first step is cutting the slots in the mating hinge surfaces. You can use an exacto knife with a #11 blade to cut the 3/16" slot in each piece their full length. It requires a steady hand. If you own a balsa stripper it can go a little easier. Make sure there's a new blade in the stripper and it's set at a large angle. Adjust the thickness of the cut to center the slot. Using balsa of the same thickness as the tail pieces, cut some test slots and adjust the position of the blade to ensure that you get the slot centerred. With the stripper adjusted, cut the slot in the edge of the two sides of the hinge. After the slots are cut, sand the edges to round them off. Place the micafilm strip into the slots allowing a 1/32" gap of micafilm between the two surfaces. You may be able to just place the hinge strip into the slot. If not, then start with a long strip of Micafilm(a couple of inches longer than the hinge length). Keep it taught by holding it on the ends and start the strip at an angle in one end of the slot. Keep moving the strip back and forth while you reduce the angle and insert it further and further into the slot. You might have to repeat this a few times before you get it right. A single edge blade placed into the slot may help to open up the slot to make things easier. There's probably other ways to do it but this works for me. Deflect the control surface and apply thin CyA to the gap to leach into the micafilm hinge. Trim the micafilm flush with the ends of the hinge. The finished result is strong, permanent with no hinge flex and weighs about the same as a tape hinge. There's no guarantee that you won't mess up the hinge slit. 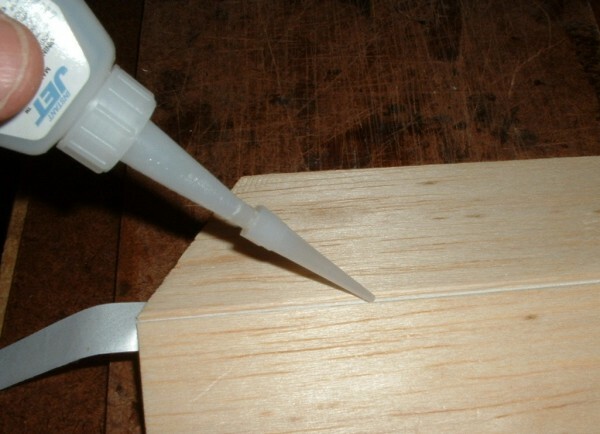 Start with a piece of balsa that is 1/4" wider than needed. That way, if you mess up the slit, you can cut 1/4" off the hinge line and try again. I use Pearl white micafilm (it was the lightest and cheapest) but it's no longer available. The XP-4 tail surfaces have red micafilm hinges. You can sand and bag the tail surfaces first and then add the hinge as long as the hinge line is not sanded. But this is much more difficult than starting with two flat pieces of balsa. 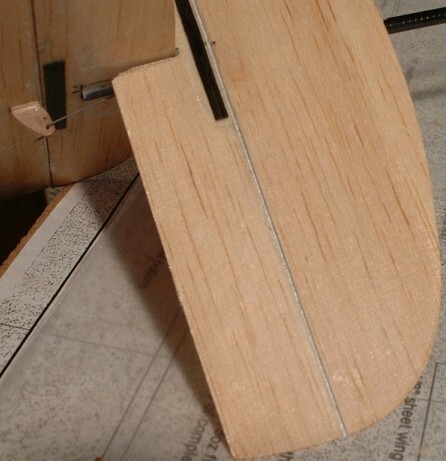 If you don't have a balsa stripper (I couldn't build with balsa without one), you could make up a slot cutting tool with some thin hardwood and a #11 blade or even a single edge razor blade.